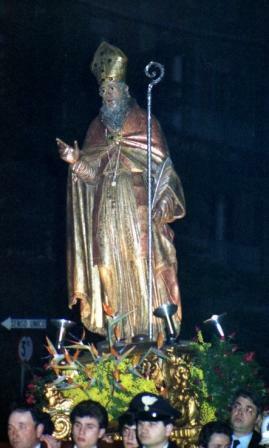 San Biagio is the patron saint of Ruvo di Puglia. 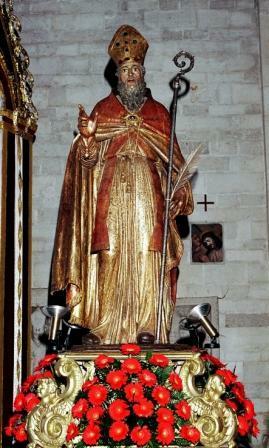 In this day in on display to the public the wood statue of San Biagio. A typical tradition is the distribution of blessed “frecedduzze” (some little taralli crook stick, ring, hands, feet, and knots-shaped) and also “misure” (some coloured ribbons to be weared to throat as sign of protection), the procession, the relic’s kiss and the pyrotechnical show. 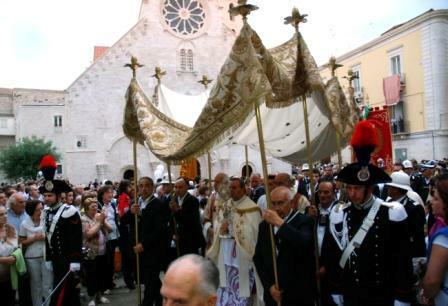 The Processions: “Desolata” (Passion Friday), “Deposizione” (“Eight Saints”, the night between Good Wednesday and Thursday), “Misteri” (Good Friday), “Pietà” (Holy Saturday) and “Gesù Risorto” (Easter Sunday). The ancient suggestive processions started up since the seventieth century thanks to different local religious brotherhoods, that are a strong tie with the past. Easter Sunday in the morning, after the joyful procession of “Gesù Risorto”, very characteristic is the explosion of the “Quarantane”, some female puppets, hanging on the streets, which symbolise the Lente Period. In this day, the country festival is a typical event. 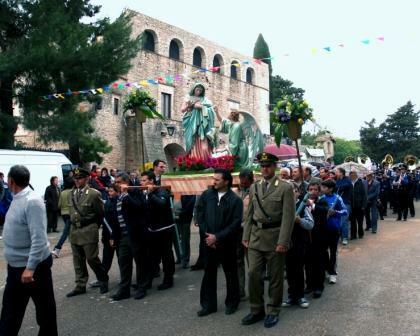 In Calentano, where is the Sanctuary dedicated to Our Lady of Annunziata, the procession of Annunziata goes on. 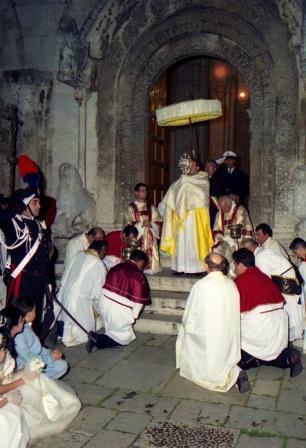 Among the usual traditions there are also the “Ottavario” and “Corpus Domini”. 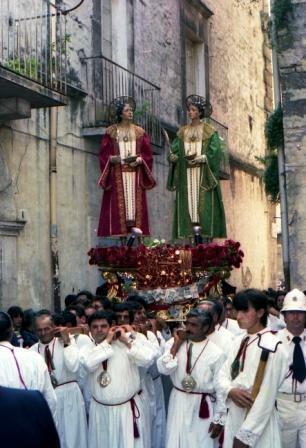 There is a procession, the air balloons throwing, and live music (in June, eight days after the “Corpus Domini” Day). It is a day dedicated to the ancient patron of Ruvo di Puglia. 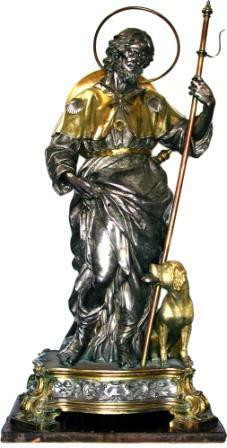 San Rocco’s silver statue of the eighteenth century, built by Giuseppe Sanmartino, a sculptor of Naples, is situated in the Romanesque Cathedral. The statue is lead in procession throughout Ruvo’s streets. They are two days dedicated to SS. Medici, Cosima and Damiano. They are celebrated in September, generally in correspondence with Sant’Angelo’s fair, the ex wild beast. 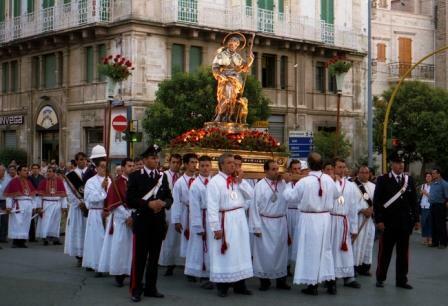 The wood statue, situated in the new church of Santa Lucia, is lead in procession throughout Ruvo’s streets. 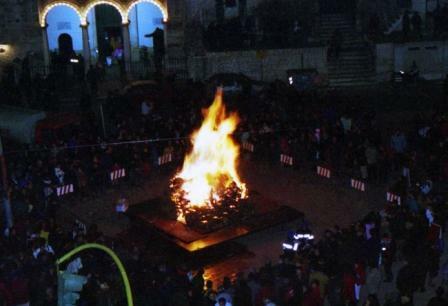 After the sunset, in Piazza Matteotti, a big bonfire is lighted in honour of Siracura’s Saint. On this occasion you can taste the traditional fried chick peas.